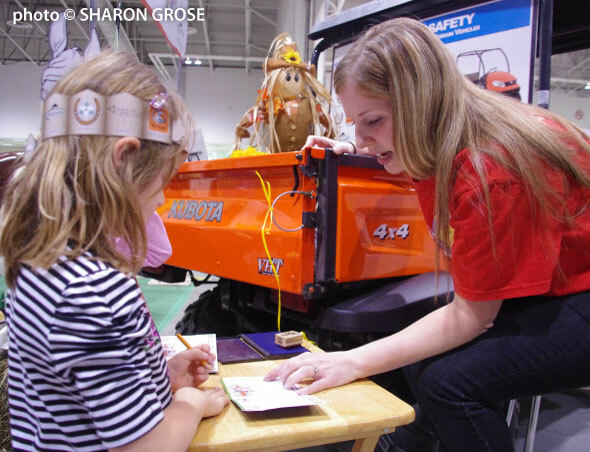 The Royal Agricultural Winter Fair in Toronto was the place to be Nov 4 – 13th, especially for eager horse lovers who could not wait to experience the new and exciting EquiMania! journey. Thanks to generous sponsorship from Kubota, Ontario Equestrian Federation, SSG Gloves, System Fencing and Workplace Safety and Prevention Services, Equine Guelph launched a new interactive safety game which proved to be a passport to fun! The young and young at heart were engaged right from the entrance gate, receiving a passport booklet to launch an adventure through the EquiMania! attraction. Each page of the passport book asked important questions and mapped out a route to the next helpful EquiMania! ambassador. Through this game of guided discovery; stamps were earned and smiles were delivered. The outcome was another hugely successful year at the Royal for Equine Guelph’s EquiMania! attraction where visitors always learn something new about the wonderful world of horses and their care. Learning about safety has never been this much fun! Can-Am All Breeds Equine Emporium, London, ON, March 16 – 18, 2012.